Shared approaches: all our experimental models of lacunar ischemic stroke are performed in mice with shared surgical protocoles. Cerebral ischemia are induced via an external approaches (craniotomy) of the MCA at the crossroad between M2 and M3 segments. Then, a specific thrombosis protocol is performed depending on the chosen model. Clot formation is controlled by using laser Doppler recording. Whatever the model chosen, the induced lesions are restricted to the cerebral cortex with a very low rate of mortality (<1%). Fig. 1: histology of clots induced either with A) thrombin or B) FeCl3. 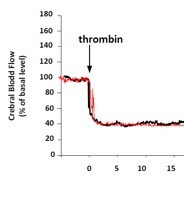 Clots induced with thrombin contain more fibrin and less platelets than those produced with FeCl3. Fibrin (red), platelets (green) and dapi (bleu) are showed. Fig. 2: Laser speckle monitoring of cerebral cortex reperfusion after tPA fibrinolysis in the fibrin-rich clots model in mouse. Dotted line showed the ischemic area. Fig. 3: Fibrin-rich clot model in mice: effects of early (20 min) or late tPA (4h) fibrinolysis on A) Angiographic score at 3h, 6h or 24h after stroke onset (ARM-TOF), B) perfusion index measured 20 min or 24h after stroke onset (PWI MRI) and C) lesion size 24h after stroke onset (T2-weighted MRI). * p < 0.05. Data expressed as mean ± SEM. Adapted from Orset et al., Neuromethods, 2016, 120:59-68. Fig. 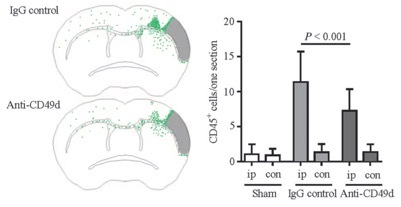 4: result example obtained with permanent ischemia model in mice to evaluate Anti-CD49d antibodies effects on leukocyte infiltration. Outcomes obtained 7 days’ post-stroke: A) superposed distribution CD45+ leukocyte out of infarct core area, B) CD45+ leukocyte count in ipsilateral (ip) and contralateral (con) hemispheres. Data expressed as mean ± SEM. IgG: control antibodies. Adapted from Llovera et al., Science Translationnal Medicine, 2015, 7:299ra121. Fig. 5: Infarcted brain volume after 5 seconds to 90 minutes of MCA occlusion. A 15 minutes occlusion mimics TIA. n = 10 per group. *P<0.05, **P<0.01 and ***P<0.001 versus sham. Data expressed as mean ± SEM. pMCAO: permanent occlusion. Adapted from Quesnault et al., Brain, 2017, 140:146-157. Numerous data are available, including a well-defined therapeutic window. The induced lesion is variable with a high mortality rate (20 to 40%). Fig. 1: Effects of alteplase (i.v. 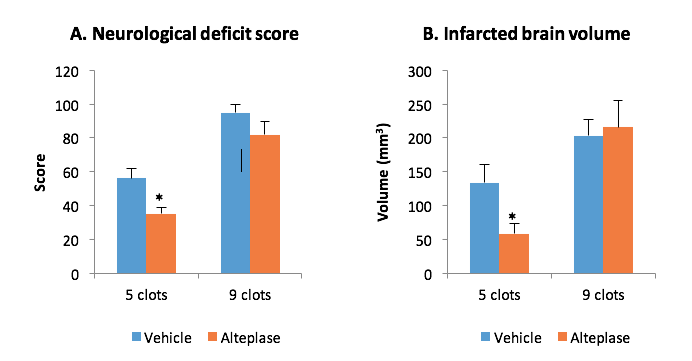 2h post-stroke) on neurological deficit score (A) and volume of lesion (B) 24h after thromboembolic stroke induced with either 5 or 9 clots in rats. Alteplase resistance is achieved with 9 clots. *P<0.05 versus Vehicle. Data expressed as mean ± SEM. Internal validation data. Fig. 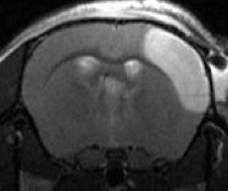 2: Representative TTC-stained slice obtained with distal stroke models. 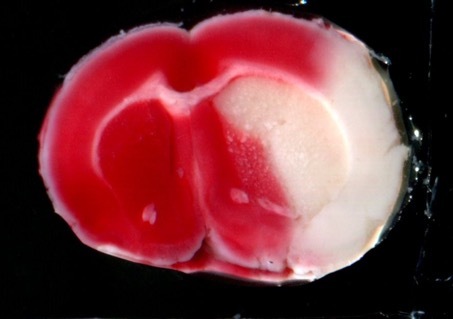 Infarcted brain tissue does not stain in red. In human, clinical trial outcomes are characterized by high variability in stroke patient impairment severity evaluated with scales such as NIHSS or Rankin scale. For instance, NINDS trial (NINDS, N Engl J Med, 1995, 333:1581-1588) reported that 20% of the patients had minor or no impairment 3 months after stroke, while 27% of the patient presented moderate to severe symptoms and 21% were dead at that time. In this setting, Alteplase slightly modified ratios in different categories (Fig. 1). Fig. 1: Effects of tAlteplase (t-PA) on outcomes 3 months after stroke. Adapted from NINDS, N Engl J Med, 1995, 333:1581-1588. Far from the well reproducible and controlled situation of the laboratory, clinical variability challenge the predictivity of preclinical trials. STROK@LLIANCE offers a unique strategy aimed at checking the performance of your candidate drug with the variability of clinical situations. A stereotaxic injection of blood is performed in cerebral parenchyma or ventricular space. In this model without vascular rupture, the volume of parenchymal hematoma directly depends on the volume of blood injected. Cerebral lesions are related to heme toxicity and overpressure. A stereotaxic injection of collagenase is performed leading to a rupture of the blood vessel’s wall. The severity of the hematoma is then dependent on the quantity of the collegenase injected. 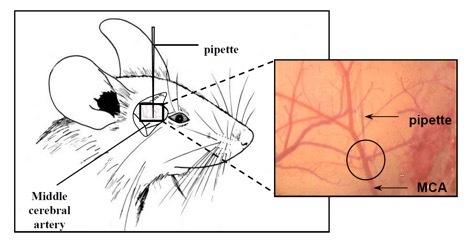 Aneurisms are induced by the stereotaxic injection of elastase in the Willis’ circle of hypertensive mice. Hypertension is induced by chronic peripheral infusion of angiotensin II.